To browse and search for what's available in the library, please click here. The library is staffed . . .
Sunday and Monday mornings from 9:00 a.m. - 12:00 p.m.
Wednesday afternoons from 12:00 - 2:00 p.m.
Unstaffed hours for self check-out of materials . . .
Monday - Thursday, 8:30 a.m. - 4:00 p.m.
Wednesday, 8:30 a.m. - 8:30 p.m. The library is located on the first floor, across the Fountain Hallway from the parlor. 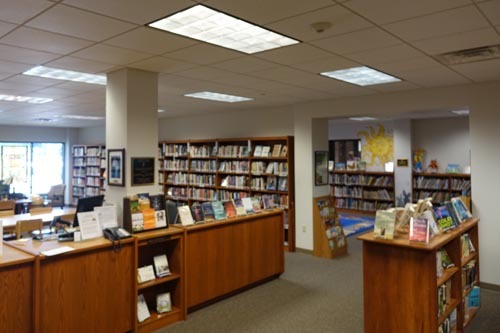 The Carey B. Sayers Memorial Library is a wonderful resource, offering a wide variety of religious and secular non-fiction and fiction materials for check-out, including books, magazines, CDs and DVDs. A second room features a wonderful Children's Library that offers a library program for the Chapelwood School for Young Children and Camp Chapelwood. You are invited to browse the library computer and the bookshelves. Materials are checked out by filling out the cards in the back of the item with your name and phone number, and leaving the card in the box on the desk. (If you are new to the library, please add your email address.) Wi-Fi is available. The library has materials on Christianity, Methodism, Christian living, My Next Step, poverty, human trafficking and more. There is a United Methodist Women Reading Program collection and many resources for parents and teachers. The Carey B. Sayers Library offers a wide variety of both religious and other fiction and non-fiction material for check out, including books, magazines and CD/DVDs. The library is staffed Sunday and Monday mornings and is open during church office hours. Wi-Fi is available. If you have questions or need information, our librarian can be reached at kjodon@chapelwood.org. The library is named in honor of Dr. Carey B. Sayers, who served the Lord and the Chapelwood community as a pastor and teacher for many years.